I had already cleaned out and closed up my boxes for spring back when our temperatures were up in the 60s. Then we had another cold spell… so today, I thought I’d better go check the boxes once again. I didn’t get to the ones out on the big field. They were fine last Saturday… but it has been very cold, so I guess I’d better get out there… maybe Friday I’ll have time. Sadly, as I suspected, I had to remove a couple of dead birds. 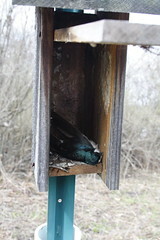 Two of the boxes had tree swallows that had apparently frozen to death. There was one fatality, however, that didn’t bother me in the least. 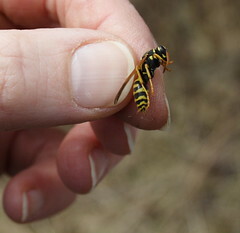 One of the boxes had a dead paper wasp… Yeah! One fewer wasp nest I’ll have to clean out of a box. On a happier note, I found our two handicapped geese! If you have not been following the story on my Flickr site, here’s the background: Somehow last summer, we ended up with two handicapped geese in the backyard. The one on the left is “Broken Goose”. Those strange sticky-out feathers are apparently all this goose got in the way of wings. Over the winter, Sarah (a naturalist at Audubon) had to capture that goose and take it home to trim those feathers because they kept getting iced over. 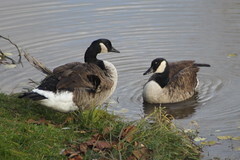 The one on the right goes by either “Wobbly Goose” or “Turtle Bait”. As a gosling, he couldn’t walk, or even stand up on his own. Sarah (who can’t resist helping animals) cared for him until he could at least wobble around. These two geese spent the entire winter in our backyard eating the birdseed we put out in the feeders. The guys felt so sorry for them, they even built them a little shelter – which they seldom used, the ingrates. 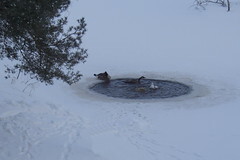 A bubbler in the bottom of the pond kept the water open for them. They even entertained an occasional guest in the “hot tub” as you can see here. When spring came and the migratory flocks returned to our sanctuary, including a pair who decided the backyard pond and its island would be the perfect place to nest. Wobbly and Broken were driven off. We would see them in nearby ponds – or sometimes out on Big Pond after that. But for the last couple of weeks, we’ve seen neither hide nor feather of them. Today, while out checking the birdboxes, I finally spotted them again. For those of you who know the property, they were at the end of Maple West. Wobbly stayed up on the trail, allowing us to get fairly close. Broken wandered off into the pond as we approached. I think it is pretty amazing that these two made it through the winter. I wonder how long they will continue to thrive? This entry was posted in birds, insects, spring. Bookmark the permalink. 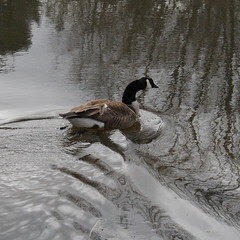 How hard winter must be for animals and birds, even the geese. I feel badly about all my belly aching about the weather recently. Looks like spring might really be coming for good! This is great news! I have been wondering about Wobbly & Broken. 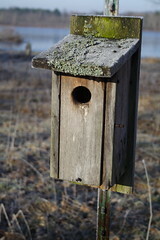 We finally got a bluebird in our bluebird house, and it too perished in the cold. 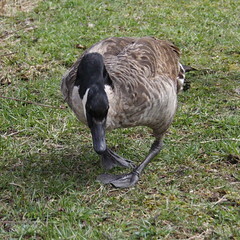 I blogged about the bird and our single backyard goose. great to hear about the two geese! I checked boxes yesterday also and only wish I had found one in there! Keep us updated on the geese!